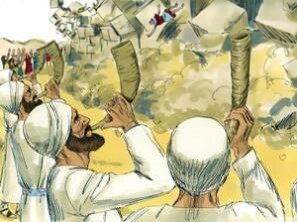 After the miracle of falling of the strong Jericho wall, the Israelites were in joy because they saw God’s mighty hand. They just ran over the stones of the Jericho wall, and conqured Jericho. They were praised God. It was the first victory in the Promised Land. They followed what God commanded, but Achan was tempted. Achan saw a beautiful robe from Babylon, 200 silver coins, and a bar of gold weighing more than a pound. He wanted them so much that he took them. They were hidden in the ground beneath his tent, with the silver buried deeper than the rest. Yes, it was really secure because Achan thought that nobody knew. However, he was wrong. God knew. Per the spies’ report, Joshua assembled about 3,000 warriors. He confidently sent to Ali. However, the reality was opposite. The 3,000 warriors were soundly defeated. The men of Ai chased the Israelites from the town gate as far as the quarries, and they killed about thirty-six who were retreating down the slope. As soon as the Israelites heard about this defeat, suddenly fear fell upon them. The Israelites were paralyzed at this turn of events, and their courage melted away. Why? Of course, Achan sinned. It was not the end of the story. The Israelites did not completely rely on God. Joshua assembled his 3,000 warriors based on his judgement, and sent them with confidence (in his judgement). It was a stark different between the first battle with Jericho. He asked to God first, and carefully followed God’s command up to the level of absurdity of just circling the Jericho wall day after day. 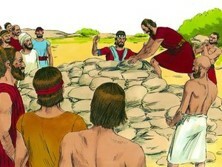 The people in Jericho laughed at the Israelites who were circling the wall, but they did not deter. 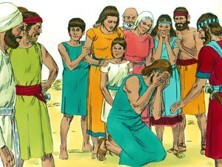 Even though the Israelites heard the laugher against them, they continued as commanded by God. The result was the completely unexpected defeat and humiliation. God allowed the defeat and humiliation because they were God’s children. 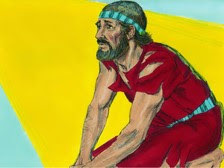 Per Achan’s confession, Joshua sent some men to make a search. They ran to the tent and found the stolen goods hidden there, just as Achan had said, with the silver buried beneath the rest. They took the things from the tent and brought them to Joshua and all the Israelites. Then they laid them on the ground in the presence of God, the LORD. Then Joshua and all the Israelites took Achan, the silver, the robe, the bar of gold, his sons, daughters, cattle, donkeys, sheep, goats, tent, and everything he had, and they brought them to the valley of Achor. Then Joshua said to Achan, “Why have you brought trouble on us? The LORD will now bring trouble on you.” And all the Israelites stoned Achan and his family and burned their bodies. They piled a great heap of stones over Achan, which remains to this day. That is why the place has been called the Valley of Trouble ever since. So the LORD anger was subsided. 2. God again promised Joshua that Ai would be given to Joshua and the Israelites. Some of the Israelites lost their hearts and courage after the defeat. God knew and reinstalled His promise to the Israelites. Yes, God’s promise had never changed, and will never forever, because God was, is and will continue to be faithful to us. 3. God also knew the Israelites’ hearts – they wanted to have things that looked good to their eyes. We, earthly parents, know children’s heart, and provide what they want as much as possible and as soon as possible. God clearly told them for this time, “you may keep the plunder and the livestock for yourselves.” Sometimes, we feel that God never answers our prayer, but in reality, God always wants to provide us as much as possible and as soon as possible. God, who knows the future and all consequences, patiently waits the perfect time. This is our faith in Him because He is faithful and ever-loving Father. 4. God also provided a perfect strategy how to attack Ai. Yes, we need His instruction. Without His instruction, we will fail. The Israelites failed not because they were suddenly weaker than when they successfully conquered Jericho. In reality, God defeated Jericho. The Israelites just followed God’s hand, which led to the huge victory. Although they won, they did not actually fight with their own strength and wisdom. All came from God. They were deceived by their own ego. 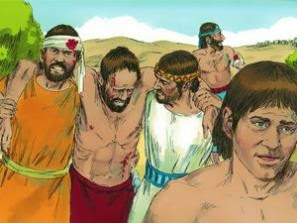 They confused that the Jericho fell by their hands. How absurd it was! Yes, the Israelites were deceived by their own ego. How about us? When something goes well, we soon forget God’s merciful and mighty hand, which is the very source of the reason why things go well. Our heart is really quick to search for an answer from our own goodness, and praises as if we have made such a greatness in our life. What we need is to humbly and carefully listen to God always – no matter what happens in our life, whether a huge success or a miserable failure. Why? God never changes. He is always our ever-loving Father, and He patiently waits for us to realize and experience Him – Our One and Only One Father and God. Are we struggling and suffering in our lives? Yes, it is too hard to vocalize what we are experiencing even to ourselves because it is too harsh for us to even recognize, which makes us even hard to bear. We just try to avoid or don’t remind of what we are going through because it is too painful to verbalize. Of course, we have tried everything humanly possible. Nothing changes. This is time to listen to God, Our Ever-Loving Father. How? Spread what we have – concerns, pains, hardships, and our pure desire – before Him, and pour out our hearts to Our Ever-Loving Father. Then listen to Him. God knows our heart and He knows what we need more than us. He will provide as much as possible and as soon as possible. Also we need to look into ourselves for our sins and arrogant egos before God, and humbly put out before God. Then ask His forgiveness and mercy. God answered to Joshua. The same God surely answers us. 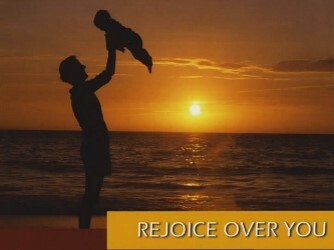 This is our faith in Him, because He is faithful and absolutely faithful to His dear children, i.e., us.